I was inspired by the pretty colors and the snowman! I began by stamping the snowman from the Holly Days stamp set onto some watercolor paper with Versamark ink. I then heat embossed the snowman with white embossing powder. I chose Seedless Preserves, Victoria Velvet and Hickory Smoke Distress Inks to watercolor the snowman. He was then die cut with the matching Sweet Cut. Next, I stamped the snowflakes from the Holly Days stamp set onto watercolor paper. The snowflakes were heat embossed with white embossing powder. I used the same colors of Distress Inks to watercolor over the embossed snowflakes. As you can see, the embossed areas resisted the watercolor. The final touches were some silver thread gathered behind the snowman, and some pretty sequins from the Paper Sweeties Shoppe! I hope I have inspired you to come play with us this month!!!! And please visit our February Guest Designer: Carrie Sheridan and give her some love! Mackie this is GORGEOUS! Love the distress snowflake background! And the sweet water colored distress snowman! Fantastic take on the inspiration! Mackie, this is AMAZING! 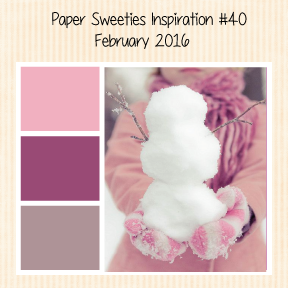 Everything about it is just beautiful - -the color, the design, the adorable snowman! You always have fabulous ideas! So pretty Mackie! 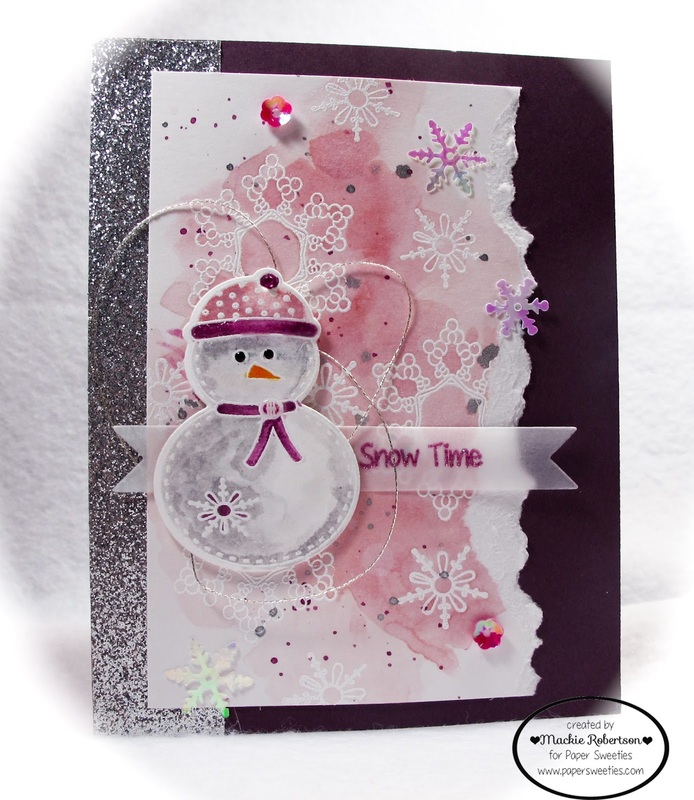 Love the sweet snowman and inky background! Gorgeous color, Mackie! 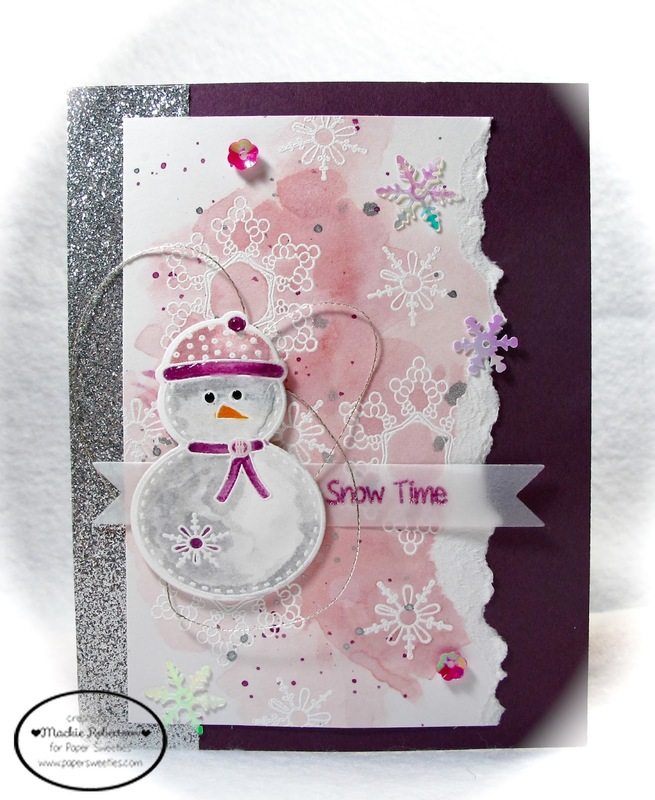 Love the daring snowman and all the pretty snowflakes! Awesome design, too, for your lovely card!! What an awesome card, Mackie! I love all the watercoloring, it turned out fantastic. GORGEOUS! LOVING all the snowflakes!!!!!!!!!!!! Beautiful watercoloring and embossed snowflakes! Always love what you create Mackie!!! Wow! Your card is amazing! I love the watercolor resist technique here! And you've added just the right amount of sparkle with your sequins! Stunning! Thanks for your lovely comment on my blog. I really enjoyed being the Guest Designer this month! The inspiration photo had so many possibilities! Fabulous card, Mackie! Love that embossed & watercolored snowman and the watercolor background. Beautiful! Have a great weekend and Go PANTHERS! Wow! Mackie, this card is amazing! Beautiful watercoloring, and I love the embossed snowflakes. The torn edge is gorgeous!